Greater Good Science project done at Berkeley University. I subscribe to their newsletter and today I was reading through a few articles and came across the book below: According to Strecher, the strength of one’s life purpose—which involves a combination of living according to your values and goals, and striving to make a positive difference in the world—can be measured, and it correlates highly with psychological wellness and even markers of physical health and longevity. I’m not sure I have a life purpose except that when I gave up work full-time I felt much, much happier and healthier. I’m not making a difference in the world, and what Strecher makes clear is that it isn’t easy. 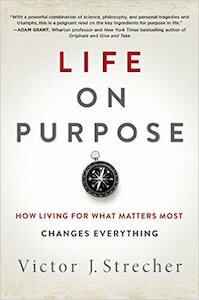 “Of course, giving lip service to having a purpose in life is not going to cut it. It has to be genuine and to truly reflect your goals and values. Also, there is a difference between finding your purpose and acting upon it, says Strecher. “The dynamic process of aligning yourself with your life purpose requires energy and willpower: wind in your sails to move you forward, and a strong rudder to prevent being blown off course,” he writes.” He goes further, “If I were you, I wouldn’t wait around for more research. I’d just get a purpose,” writes Strecher. “The scientific evidence supporting the benefits of one is extremely promising, and, at the risk of sounding a bit alarmist, we need it.” Not sure I have the willpower or a purpose but I am more grateful generally and living more keenly in the present. Mindfulness needs to be practised not just thought about so willpower is definitely important for me. I was tired this morning and not very focused so when the Greater Good Science email came through it helped me get back on track. I also read about the more detailed specifics about a gratitude diary. At the moment I just tear off the next page of my calendar and write it on the back and put it in the box the calendar came in. Apparently, when you dig into the research, you find that gratitude journals don’t always work—some studies show incredible benefits, others not so much. Emmons, a professor at the University of California, shared these research-based tips for reaping the greatest psychological rewards from your gratitude journal. Don’t just go through the motions. Research by psychologist Sonja Lyubomirsky and others suggests that journaling is more effective if you first make the conscious decision to become happier and more grateful. “Motivation to become happier plays a role in the efficacy of journaling,” says Emmons. Go for depth over breadth. Elaborating in detail about a particular thing for which you’re grateful carries more benefits than a superficial list of many things. Savor surprises. Try to record events that were unexpected or surprising, as these tend to elicit stronger levels of gratitude.